We operate a fish culture station (hatchery), located in Point Edward, Ontario. Throughout the hatchery cycle we give tours of our facility to any organization requesting one. 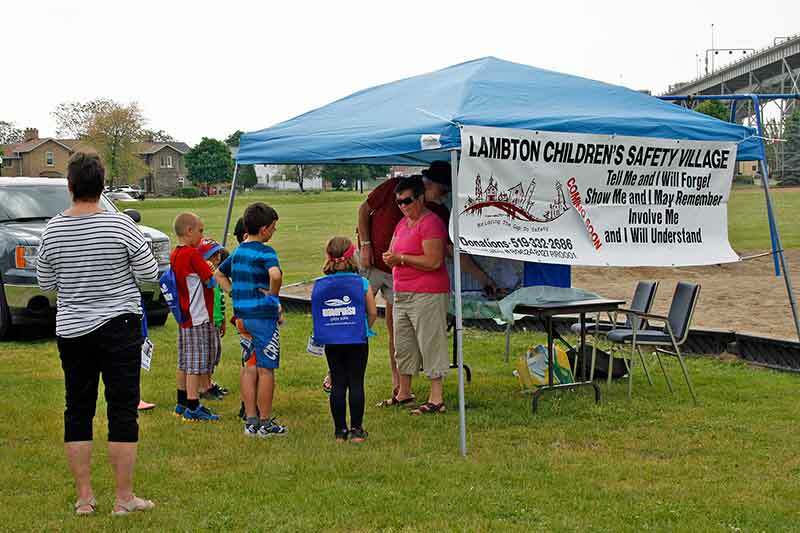 The tours are attended by groups throughout Lambton and Kent Counties, such as public school children, cubs scouts and guides, seniors homes and service groups. Early each spring we also run a two day open house, which includes tours of the facility. The open house is attended by anyone in the area that weekend, we have had visitors from as far as Japan and Russia. Our tours and open house programs provide the opportunity to visit and see first hand, nature at work for about 3000 people annually. We maintain a public viewing and feeding area at our hatchery pond, this pond is stocked with Rainbow trout. 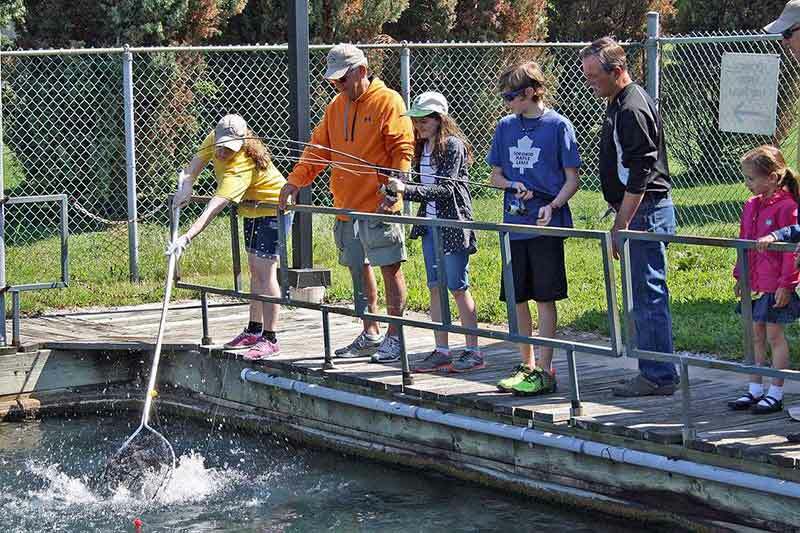 Each spring we hold a kids day at the pond and allow every kid to catch a large sports fish. The fish are then released to the local waters. In April or early May we run a 10 day fishing derby known as the Bluewater Salmon Derby. The derby attracts from one to two thousand entrants from all areas of lower Lake Huron and the United States. This Derby is our major fund raising project in support of the operation of the hatchery. The Bluewater Salmon Derby permits an opportunity for a significant angling opportunity for all anglers in lower Lake Huron. For our annual Derby we have included several different categories for shore fishermen which allows anyone, including youth, to participate and does not necessitate the ownership of a boat. One of our greatest achievements has been the operation of a successful fish hatchery, releasing 150,000 Chinook Salmon per year since 1985 and 50,000 Rainbow Trout each year for the last five years. 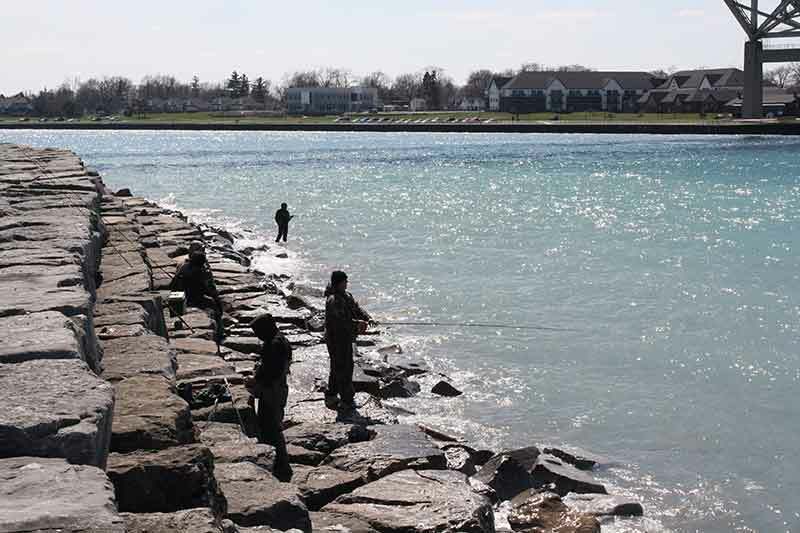 The continued operation of the hatchery ensures a vital cold water sports fishery for southern Lake Huron and the St. Clair River. Without the annual stocking program from the hatchery the Salmon and Rainbow fishing in this area would be significantly reduced. The hatchery functions are carried out by members of the Bluewater Anglers and all work is done with volunteers. A crew of four people with a team leader are responsible for the daily operating functions, there is a different crew each day. A larger crew of volunteers works one day a week to handle any outstanding maintenance and to test operate the emergency backup systems. The volunteer staff is managed by one member who is designated as the hatchery manager and he has an operating committee who are members in training to eventually take over as hatchery managers. The hatchery manager is responsible for all operations and maintenance of the hatchery and building. 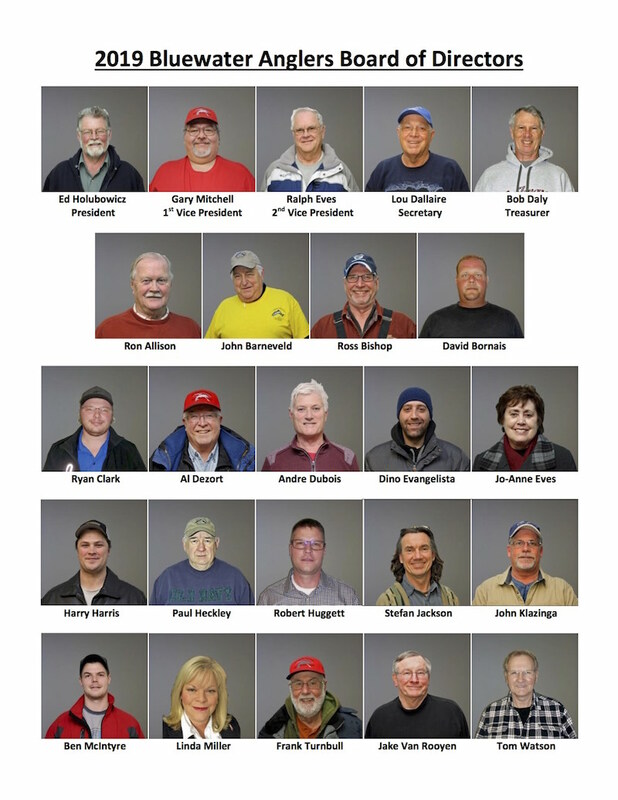 The hatchery manager reports directly to the board of directors of the Bluewater Anglers. Any maintenance items that cannot be handled by the member volunteers are contracted to local businesses. At present the club has membership of approximately 300 and the club is governed by a board of 15 directors. All events are co-ordinated by a committee. Depending on the event the committees vary from 1 to 12 members for organization and more member involvement on the days of the actual event. Where did it all start? For the part not a lot of people know. Back in 1978 or early 1979 three fishermen, Pete Bothwell, Rick Parent and Don Cox were at a sportsman show in Port Huron sponsored by the Port Huron Steelheaders, latter to become the Bluewater Sport Fishing Association. The Michigan boys were into down rigging and other methods of fishing for salmon and rainbows that were new to these Canadian fishermen and they went to see what it was all about. The three of them ended up joining the Port Huron Club. After a few meetings they said to each other “Why wouldn’t this work on the other side of the river”. Let’s see what happens? The three of them posted signs around town, at the plants and the old Centennial Park boat launch to see if there was any interest in forming a club in Sarnia Lambton. The initial response was about 100 people who showed up for a meeting at the Sarnia Library in the fall of 1979. From this first meeting 30 people signed up and things started to roll. The directive of the first 30 members was to generate interest. Early in 1980, there was more than enough desire and the formation of the BLUEWATER ANGLERS was off and running. The early years saw membership of 600 to 700 interested fishermen and people who seen the value of what was happening. Meetings were held at one of the local schools. With a broad range of representation, teachers, engineers, lawyers, construction workers, chemical plant maintenance and operators and retirees the emphasis accelerated. By April 10th 1981 a charter was granted and immediately the club lobbied the MNR for stocking of rainbow Trout into Lake Huron. As noted in the Letters Patent, the Bluewater Anglers were founded to promote water conservation and quality, to deliver educational programs, to co-operate fully with government ministries and education establishments in conserving our ecology and fisheries and to operate a fish culture station. In 1981 the club formalized a request to the MNR for an experimental hatchery to be built & operated by the Bluewater Anglers with the MNR providing financial funding and technical support. The idea took hold and resulted in The Bluewater anglers receiving grant of $30,000 in 1982 from The Community Fishing & Involvement Program (CFIP) for Ontario. This experimental, or pilot, hatchery was constructed by members of the BWA in 1982. It was located on the water pumping station property in Point Edward which was owned by the MOE. 2 wells, 2” sand points were drilled during the summer of 1982. the facility was ready in late January of 83 and stocked with 10,000 Rainbow trout in February. These initial Rainbow trout, approx. 25 gr. fish were the guinea pigs, from this first batch of fish it was learned firsthand how to successfully raise Rainbow Trout. The first stocking of Rainbows, from the pilot Hatchery took place in May of 1983 at an average wt. of 50 grams. In Aug. of 1983 another 8,000 rainbows were received. These were only 1.5 to 2.5 grams and were stocked into lower Lake Huron in May of 1984 at an average size of 68 grams. (7” to 8”). In August of 1984 the Ontario Ministry of Natural Resources sanctioned the Stocking of Salmon into the Canadian waters of Lower Lake Huron. Our Club immediately petitioned the ministry to extend our Pilot Hatchery license to raise salmon during the final year of the 3 yr. Pilot Hatchery Mandate. Through the direct personal support of Allen Pope, the Minister of the MNR, the club was authorized to raise Salmon. A small incubation trough was installed in the pilot hatchery and in Sept. of 1984, 35000 salmon eggs were fertilized and set. These eggs were collected by club members, from the streams of Rock Glen and Bright's Grove. These eggs hatched in November and as swim up fry were on starter food by mid Dec. These original salmon smolts were stocked out into the Cull drain in May of 1985. The inclusion of salmon in the pilot Hatchery reduced the number of rainbows to only 3,000 for 1985. During the 3 years of the pilot hatchery operation 21,000 rainbows and 12,000 Chinook Salmon were stocked to Lower Lake Huron. It was understood and included in an agreement with the M.N.R. that success with the Pilot Hatchery program would be one of the requirements needed to lobby for a full scale permanent hatchery. Formal support for the permanent hatchery began in Oct. 1985. Most of our activities over the years have been in support of the hatchery and our goal of putting something back into the sport we all love and enjoy.